A new study suggests that women can continue using antipsychotic medications during the first trimester of pregnancy without meaningfully increasing the risk of birth defects in their offspring. The study, by Krista F. Huybrechts and colleagues in the journal JAMA Psychiatry, looked at Medicaid users who filled at least one prescription for an antipsychotic medication during their first trimester of pregnancy, when an embryo’s vital organs are formed, and went on to have a live birth. Birth defects, including cardiac malformations, in these children were identified in the first 90 days after delivery and compared to the number of such abnormalities in the children of women on Medicaid who did not receive a prescription for an antipsychotic drug during the first trimester of pregnancy. The number of abnormalities was slightly higher in the children of women who had received atypical antipsychotics than in those who had not, and slightly lower in the children of women who had received a typical antipsychotic than in those who had not. Huybrechts and colleagues concluded that taking an antipsychotic medication during the first trimester of pregnancy does not meaningfully increase the risk of birth defects in the offspring. The children of women who took the antipsychotic risperidone did have a small increased risk of birth defects, including cardiac malformations. 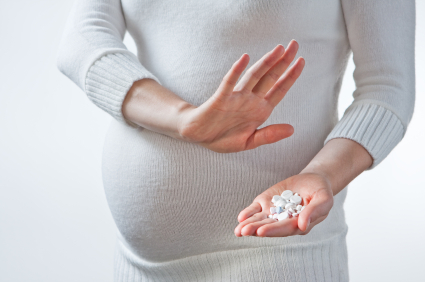 The researchers called for additional study of risperidone use during pregnancy. In pregnant women, exposure of the fetus to the anticonvulsant valproate (VPA or Depakote) is associated with a variety of serious problems that include congenital malformations, developmental delay, and autism. The major congenital malformations that can result from valproate exposure include spina bifida, which results in lifelong paralysis of the child’s lower limbs. Developmental delay resulting from valproate exposure can cause an average loss of 9 IQ points compared to children exposed to other anticonvulsant drugs in utero. The effects appear to be in part dose-related and dependent on the intensity of combination treatment with other agents. These deficits were originally seen in children at 3 years of age and were shown to persist in six-year-olds according to an article by Meador et al. this year in Lancet Neurology. Now in addition, fetal exposure to valproate has been liked to autism and related disorders in an 11-year longitudinal study published this year in the Journal of Neurology, Neurosurgery and Psychiatry. A diagnosis of a developmental disorder occurred in 17% of children whose mothers were on valproate as opposed to 2% whose mothers were on carbamazepine and 7% whose mothers were on lamotrigine. Neurologists are increasingly recommending that all women of childbearing age who are on a treatment regimen including valproate be treated with folic acid and vitamins B6 and B12, in the hopes that these might mitigate valproate’s effects on the fetus in the case of an unplanned pregnancy. The effectiveness of these vitamins has not been directly demonstrated. However, the study by Meador et al. did show that children of mothers who took prenatal folic acid supplements had IQs on average 7 point higher than children whose mothers did not. The benefit was seen only when mothers were already taking folic acid when they became pregnant and was not observed in children of mothers who began taking it after the first trimester. Women of childbearing age should avoid valproate and if this is not possible, they should carefully protect themselves against an unwanted pregnancy. Women with bipolar disorder are 3.9 times more likely to have unplanned pregnancies than women of similar age in the general population. These data suggest the importance of careful education about birth control in patients with bipolar illness so that pregnancies can be planned for periods of good health and so that appropriate pharmacological measures can be taken.